On 27 May 2017 in Riga, during the conference of the Baltic Forum signed a Memorandum of cooperation between the Atlantic Council (USA), the Baltic Forum (Latvia), the Institute of Contemporary Development and Primakov National Research Institute of World Economy and International Affairs (both Russia) about cooperation and creating a Dialogue to enhance mutual understanding and to develop a road map of development of relations between Russia and the West. EU and Russia’s Common Neighborhood: Shared or Contested? Chairman of the Management Board of the Institute of Contemporary Development Igor Yurgens took part in the DER Advisory Board Meeting, which was held in Lech on April 2-4. 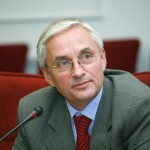 Оver 70 European political, diplomatic and military leadership figures, including Igor Yurgens, express support for the Iranian nuclear agreement. A group statement of European Leadership Network calls the July 14th agreement a sound framework for ending the crisis and urges specific actions to implement the deal by the U.S. Congress, EU countries and Iran. — For the economy and business – what hurts most under the sanctions? — The sectoral and financial sanctions. The cheap money we used to have is gone. To top it all — and it’s either another tool or pure circumstance — oil prices are dropping… The lack of options to borrow money to service debts, and the budget cuts resulting from almost a 30% oil price drop — that’s the heaviest blow to be dealt to both the budget and business. How do we get out of that? – That’s an interesting question. Chairman of the Management Board of the Institute of Contemporary Development Igor Yurgens took part in the work of the 38th European session of the Trilateral Commission, which was held in Belgrade October 31 – November 2. During the meetings the discussion focused on the current state of affairs in the European Union, the Ukrainian Crisis, expansion of European integration in the Southwest Balkans, energy policy of the European Union, role of new technologies in economic progress on the whole and in infrastructure construction in particular. Read more in the October issue of the INSOR Analytical Bulletin.